I’ve decided to do an internet experiment. You know me and experiments, especially where the internet is involved — I can’t help myself. This time is special because it’s a disappearing act. For the next few days, I’m going to take myself off the internet as much as possible. This isn’t forever, nor am I committing to even a shot period of total digital abstinence, but for a short while, rather than being on Twitter, Facebook and Tumblr all the time, I’ll be interacting with people on the physical plane. You know, like my husband and our friends. And instead of doing my writing on the computer where I am constantly tempted to Google something or message someone or share my every thought, I’ll be writing in my notebook. Longhand. The way I fell in love with writing a long time ago, and the way I still think most clearly. Meanwhile, I’m letting my pre-scheduled blog posts run as planned, and they’ll be automatically sent to my social media profiles through the wonder of WordPress plugins. And because I don’t know how long I can go without telling The Internet what’s on my mind, I will also write each day about the things I’ve been doing on my side of the screen, in “the real world,” as they say. 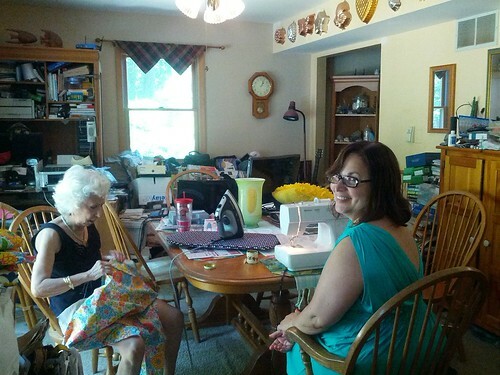 For example, today I worked on this dress-making project with my mother-in-law (Chuqui) and her mom (Bueye). That’s them in the picture up top. I decided for no particular reason that I wanted to make a dress. Chuqui helped me pick out the pattern and the fabric, and we started sewing the other night before dinner. Attempting to finish the dress today, we realized it was a lot smaller than it should’ve been. I usually wear between a size 8 and size 10 (curvy girls, represent! ), but because the pattern looked small we cut the fabric for a size 14, and it still didn’t fit. We had no idea what we did wrong, which is why we had to call in the expert. 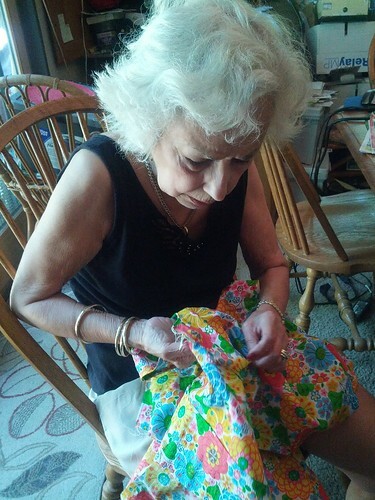 Bueye has been making beautiful things all her life,and though she doesn’t do seamstress work anymore, she appeared to enjoy putting her skills to work and showing us young chicks up. There are lots of other things I’ve been thinking about, but the noise in my head these days is just too much. Being on the internet 24/7 has made me feel trapped by the news cycle, to use a cliche. Especially in the wake of the Texas legislature’s assault on women’s rights and the Zimmerman verdict … I’ve been feeling sortof powerless and sad, and the constant flow of information doesn’t help with that. So, I’m gonna step away for a while until I feel like I have my head on straight again. And I don’t know how long that’ll take. I hope it’s quick because I want to get back to talking with everyone and having a grand old time. But you can’t rush these things, so it’ll take as long as it takes. Oh, and I will still teach the online yoga class and respond to e-mail because I do want to hear from you and interact with you on a human level. Just not in the intensely public format of social media right this second. I know exactly how you feel. This is a great idea. Thanks, Jim. I can’t tell you how many times in the last 24 hours I’ve had to restrain myself from checking Twitter or tweeting some totally inane thought. It’s a little absurd, really, but when I just sit in a quiet place and relax, it feels really good to be unplugged. I can relate to your thoughts on always being connected. As for sewing, the only thing you did “wrong” was fall victim to pattern vs. industry sizing. I’m about your size, but in patterns? Sometimes it goes as high as 20. -_- Take this opportunity to get some good, accurate measurements of yourself. That’s the only way you’ll find the right sized pattern. I need to do that, too, because I can’t really measure my back by myself. Hey, Jen. <3 Thanks for the sewing feedback. I think you're right about getting some accurate measurements. I don't know if I will be making any more dresses any time soon, but I do really like the idea. Anyway, it's always good to know your actual measurements so you ever-shifting sizes in clothing stores. In a world where a woman is largely defined by her physical appearance, figuring out your dress size can be a torturous experience!